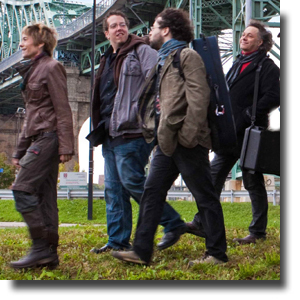 La Bouttine Souriante (The Happy Boot) is an eclectic 10-piece band from Quebec, featuring fiddles, step dancing and brass, mixing traditional French Canadian folk with dollops of jazz and funk. Despite having undergone a changing roster of musicians since its founding in 1976, the band’s unique brand of world beat continues to appeal to audiences throughout the world. With the exception of the step dancer who came out on selected numbers, almost all of the musicians play more than one instrument and almost all sing. In addition to the drummer, a few also play percussion and do a bit of foot tapping and step dancing. The featured instruments included keyboards, fiddle, guitar, accordion, trombone, trumpet, saxophone, bass (acoustic and electric), drums and percussion. This music can only be described as neo-traditional, with an emphasis on the neo. The program makes clear that the 23 songs performed, and the stylistic traditions from they are derived, have a long pedigree in various regions of Quebec, but at the same time the traditional fiddling and accordion playing is accompanied by the liberal use of brass arrangements, which are occasionally even discordant. At times, I felt like I was listening to Breton fiddling and step-dancing meets Earth, Wind and Fire – a sort of French-Canadian folk-funk. Even the pixieish step dancer added interpretative dance elements to her traditional amplified heel tapping. Fortunately, the arrangement of the seating at The Vogue afforded room for a writhing mosh pit in front of the stage and many of the younger patrons were taking healthy advantage of it. While my partner found the sound levels a bit high, and I thought the keyboards were lost in the mix on most numbers, in general the band played tightly and with a surplus of energy. Overall, the band delivered and the audience had a good time.